This article is a short summary of EarthBound. EarthBound is a role-playing game for the Super Nintendo. It is the second in the EarthBound series, and the only one to be released outside of Japan for its original console. At launch, the English version of the game was packaged with a full strategy guide and a set of "scratch and sniff" cards. Because of low sales and poor critical reception in America, the game was never released outside of Japan and North America, though the game's dedicated fan base has since raised the title to the status of a cult classic. 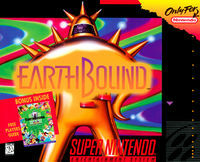 In 2003, EarthBound was included in a Japan-exclusive compilation for Game Boy Advance, Mother 1+2. Later in 2013, the game was re-released for Wii U Virtual Console, the first re-release of the game in North America, and the first release of the game in Europe. Bizarre aliens roam the earth!! Intergalactic terror strikes the small town of Onett as a blazing extraterrestrial object crashes in the night! The earth now faces imminent destruction by the evil threat known as Giygas! Armed with a cracked baseball bat, a cookie and an ATM card, a courageous boy named Ness vows to save the planet from hideous destruction. He must first find his heroic companions, Paula, Jeff, and Poo, along the way to eight mysterious places called "Your Sanctuary" in order to gain power and put an end to the interstellar threat. The citizens of Onett lend their support by providing high-tech gadgets, robotic time machines, and wacky stories about how life has become. Lurking aliens and inexplicable phenomenon are being reported throughout the countryside. Our four wonderkids band together with innovation, psychic powers and resourceful weapons. Will Ness succeed in his attempts to ambush countless frightening monsters as he travels? The ultimate test lies in the impending encounter with the all powerful Giygas! The story of EarthBound begins with a meteor crashing into Onett, a town in a place called Eagleland. It wakes a young boy, known as Ness, and he leaves to investigate. After arriving at the meteor, a bug from the future named Buzz Buzz apppears and tells Ness that it is his destiny, along with three others, to travel around the world and find the Eight Melodies to defeat an alien known as Giygas. EarthBound is a 2D RPG that uses oblique projection. The player controls party members as they travel through the world of dungeons, town, and other places. Along the way they fight monsters and afterward the party members will receive exp., which builds up until the member gains a level. This increases their attributes, such as offense, defense, IQ, guts, max HP and PP, speed, vitality, and so forth. The game does not feature an overworld map screen unlike most RPGs of its time and instead features one large seamless world. Unlike Mother, EarthBound does not feature random encounters; instead the player enters battle when they come in contact with an enemy, similar to Zelda II: The Adventure of Link. Unlike most RPGs which featured swords and magic, EarthBound featured more modern, unconventional weapons such as baseball bats and PSI, which uses up PP. In battle, the party and enemies possess HP which scrolls down as they are attacked, allowing for one to heal or attack while their health drops. If a character's HP drops to zero, they will become unconscious and unable to fight. If every party member is knocked unconscious, a message will appear to ask the player if they would like to continue, and if they choose to continue they will be taken back to the last save point, or telephone. Because battles must be activated with contact, the player may touch the enemy while they are facing a different direction and get a first strike (indicated by a green swirl), hit the enemy face on and activate a normal fight ( a gray swirl), or they may be attacked from behind by an enemy and face a back attack (a red swirl). Additionally, if the player becomes powerful enough, they will eventually start defeating enemies just by touching their overworld sprite (which results in the same exp. gain as if they had battled) and weak enemies will flee from the player. The currency used in EarthBound is US dollars which is deposited by the player's father every time they win a battle into a bank account and can be withdrawn at an ATM. The money can be used to buy weapons, armor, items, medicine, etc. The player can increase each party member's strength by equipping them with these weapons and armor. The player may also stay at hotels for a small fee to fully heal without using items. Mother 1+2 Game Boy Advance) JP: June 20, 2003 A compilation release of both Mother and EarthBound. The port of Mother 2 in this release includes gameplay changes made for the English version of the game. WW: July 18, 2013 A port of the game released as a digital download on the Nintendo eShop for Wii U, with Virtual Console emulator features. This would be the first release of the game in PAL regions. EarthBound New Nintendo 3DS (Virtual Console) WW: March 3/4, 2016 A port of the game released as a digital download on the Nintendo eShop for Nintendo 3DS (exclusively for New Nintendo 3DS systems), with Virtual Console emulator features. EarthBound Super Nintendo Entertainment System: Super NES Classic Edition NA/EU: September 29, 2017 A port of the original game, re-released as one of twenty-one games built onto the system.